…Presumably being the Xenon Valkyrie. 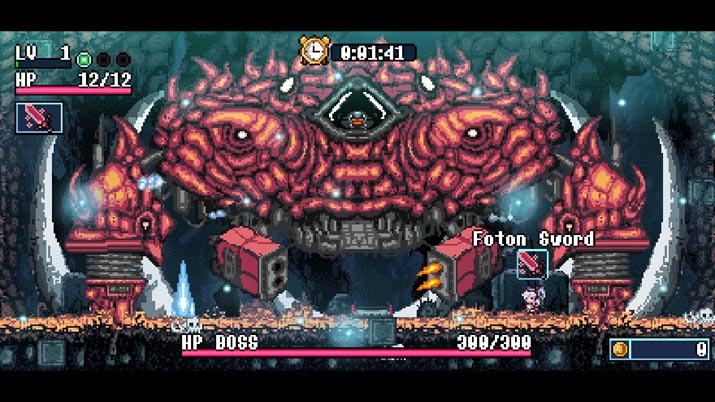 Xenon Valkyrie is a retro roguelike platformer that incorporates RPG and Metroidvania elements. Essentially, it’s a hopeful mixture of many genres and mechanics that aspires to be both unique and exciting. The game boasts an arsenal of over 100 weapons, a variety of enemies and bosses, different routes across many world stages, as well as multiple endings, assuming you are skilled enough to reach the final boss. With any game that implements even an ounce of platforming, it’s paramount that movement feels both fluid and responsive. In this instance, I would say Xenon Valkyrie meets the standard of mediocre. The jumping and running physics seem very average and do enough just to get the job done—neither overwhelmingly smooth nor excessively clunky. Though, interesting mechanics that help compensate are the wall sliding and jumping which add more dynamics and dimensions to both the movement and combat. Unfortunately, issues with character movement are amplified when paired with un-optimized controls. Controls clearly show bias towards playing with an external peripheral. All the on-screen button prompts only correspond to buttons of a console controller which makes navigating menus and such especially confusing since, at times, the player may not know what the keyboard equivalent is to an "A Button" or "B Button." On top of that, the default keyboard layout is fairly awkward to use, but somewhat fixable through key-bind customization. All of this invites the notion that the game was primarily designed on the basis that the player would be using a controller to play, and thus, discriminating against those using a keyboard. 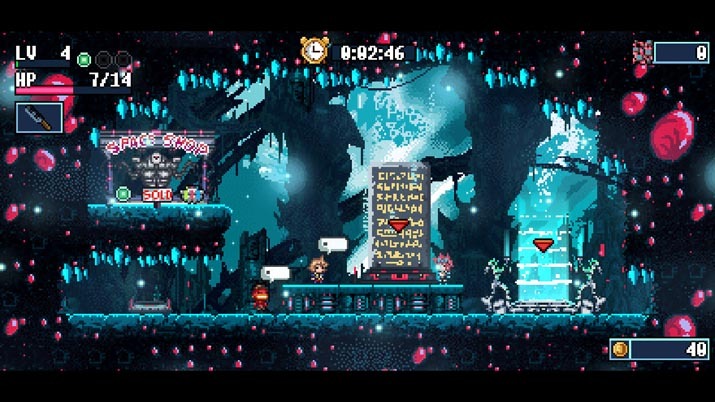 Put together decreased keyboard functionality with sub-par platforming, and what you get is a lot of unnecessary damage taken due to the simple fact that you can't precisely get your character to move where you want. Also, there are many imbalances to how much damage certain hazards apply, and how scarce health is. Although this does comply with the signature unforgiving difficulty of a rogue-like, many deaths will not seem justified. A game should be hard because of the player's shortcomings not because of its own. Despite these issues, there is a body of content to explore. At the start of the game, players may decide upon three different characters to play. Each character maintains different stats, skills, and weapons and is therefore suited to different playstyles. After choosing a character, the player enters a lobby area that contains many venues that are developed across multiple runs. There's the teleporter that plays the role of a checkpoint that players can use to transport them to previously encountered worlds, and the shop that accepts a special type of persistent currency called "teamerite," acquired throughout a playthrough. Once the player is ready, they may step through the portal and begin the first level. Each level is randomly generated and offers chests that contain weapons from a large pool. Most of the time, these weapons are just simple re-skins with basic stat upgrades, but still, add variation to each run. There is also a shop sequence between each level where players can buy items, interact with multiple NPC's, or distribute talent points into leveling up stats. These talent points are gained via collecting experience from defeating monsters and leveling up. Such elements of character and stage progression are an alluring incentive to keep players engaged in their play through, though some may view it was generic and uninspiring. There are many enemies and bosses to pit your skills against. While there definitely is variety, many of the monsters have uninteresting AI and simple attack sequences. Your ability to survive is based more on avoiding contact and exploiting the patterns of different enemies. The bosses follow the same rules, except for some reason, ranged weapons are disabled during these fights. 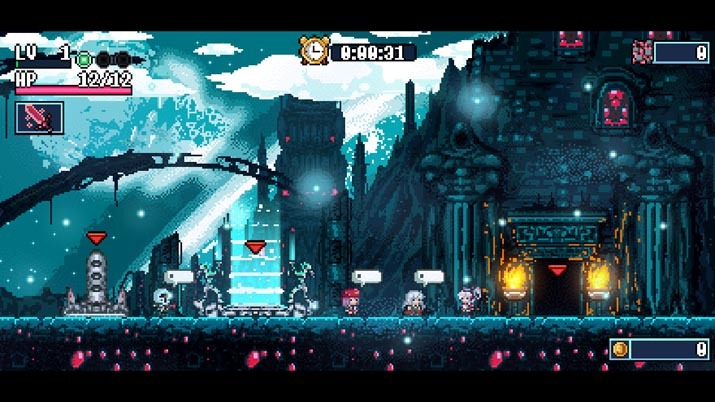 Overall, the combat is lackluster, and most of the real danger you'll encounter is how the funky controlling interacts with the enemies and environment. Lastly, although the actual gameplay is riddled with ambiguity in both pros in cons, the music and art are solid in their quality. Both the retro chiptune music and pixel art are intricate and well-crafted. The soundtrack is lively, fun to play to, and gives me the vibes of a Mega Man game. And the art style is very detailed, utilizing a gorgeous palette of colors to paint magnificent environment and scenes. The characters are also represented with aesthetically simple yet charming sprites.